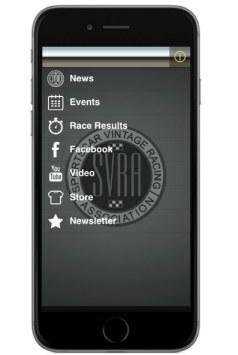 The Sportscar Vintage Racing Association (SVRA) released its mobile phone app developed for its members and vintage auto racing fans. The first release of the app enables both spectators and SVRA members to easily stay in touch with the latest SVRA news, whether at the track or on-the-go. The app is free to download and is available on both Android and Apple platforms. A key feature of the app is the delivery of the latest event information. This includes timing results of SVRA races as they happen! During a race weekend the sanctioning body typically presents dozens of practice and qualifying sessions as well as races across numerous SVRA run groups and frequently hosts other series such as professional Trans Am, America’s GT Cup and Historic Trans-Am. Additional features include: up-to-the-minute SVRA announcements, links to our interactive social media accounts, online event registration, venue information and a lot more. Download the SVRA App for free at Google Play for Android devices or the App Store for Apple devices.